Ooh damn y’all. We are coming down TO it. There’s not really all that much to report today. We really finished up the main bulk of the shopping and stuff last night so today has been quiet. But we’re heading into the weekend and I just know I’m going to start getting more and more crazy. Actually, I was getting kind of nuts about the “Something old, something new” bit. My dress, shoes, and hair are new. I’ll be wearing a very old pair of earrings from Flirt. My shoes are blue. But the something borrowed bit was troubling me. 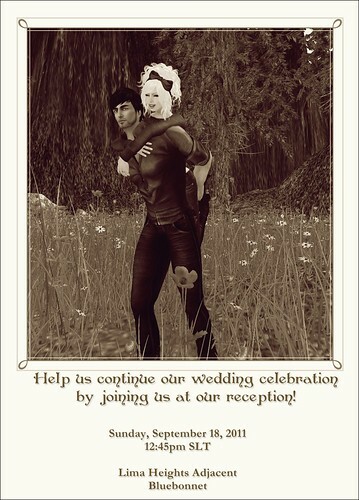 Luckily, Ulaa reminded me that Sixx loaned us the reception tables, so that totally counts as my something borrowed. Woot! I keep having crazy dreams about the wedding. Night before last, I dreamed that we were at the church and Ulaa wasn’t there. I kept running to the window to see if she was there yet and she wasn’t. Then people I hadn’t invited, like an old sorority sister and my RL Bestie and her hubby, showed up and I was struggling to add them to the access list really fast. Then when it was time to get to the altar, I took the wrong turn and got lost and ended up running all over trying to get up to where Aldwyn was. The minister was drunk and kept baptizing him at the altar. I don’t know what any of that meant!! Then LAST night, I had another dream that I couldn’t quite get to the altar and I kept trying to call, despite the fact that I was pretty close by. And then only 2-3 people showed up for the reception and I was so upset! I really hope that these dreams are my way of working out any worries and that nothing like that actually happens on Sunday. Of course, when I told Al that I was worried about the whole getting lost to the altar part, he told me that if I got lost, he’d come and find me. Awww. That’s my man! Day 4 – Looking for cake, what do you think?? We have gotten much accomplished! Sixx was a dear and came and dropped us some tables & chairs, we bought the bouquets & boutonnieres, we bought the cake [which was bigger than I thought it would be! ], I put out the champagne, Al bought the dance we’ll use for our first dance, and then he proceeded to yell at it because it had hovertext. All that has to be done now is…. well, not much!! The music has been sent, I have shoes, we both have rings, we have the officiant, Ulaa has her dress, I have my dress, Al has his tux… We are zipping along here!! I really wanted to thank you guys who have been following along, supporting us, and genuinely making us feel very loved. You guys don’t realize how much it means to both of us! We hope to see some of you at our reception!! I know I haven’t had a chance to meet everyone who reads my blog in person, and it really would be nice to see some of you at the reception. 🙂 And hey, it’s not a party until the sim crashes, am I right?? Day 5 – I Found Shoes! No, they don’t come with the socks. I just happened to be wearing socks and I’m too lazy to get undressed sometimes. But yay SHOES! They’re the flower pumps from G Field and the perfect color of blue and I love them and I almost never want to take them off because THANK GOD I FOUND SHOES. Ooh, and!! Do you see the table back there? Sweetheart Jori Watler sent me a Greedy table!!!! Happy! I stayed up too late last night playing Greedy by myself. Playing alone is fun because I always win!! I also got the ceremony music done and sent off to Elle and I’m almost finished reviewing the ceremony and vows and stuff so I can send back to Pam, but I need Aldwyn to take a look at it first before sending it so he’s not just blindly saying “I do” up there. Oh, he just did and said it’s fine. Yay. One more thing off the list. Actually…. all we have now to do is buy the flowers, cake, and set up for the reception. Woot woot! We’re watching Ulaa build the house we’ll be using after the wedding. It’s big and beautiful and I can’t waittttt to live with my new husband!!!! We finally got an officiant!!!! Aldwyn has a friend that HE was officiant for years ago, and so she happily agreed to be our officiant. AND because she’s done this before, she has taken a biiiiggggg load off of my mind! Thank you, Pamala!!! Oh, and she let me play my first game of Greedy ever, too! I did NOT win. But now I want a Greedy table. Why doesn’t the Marketplace have wedding registries? So… the invites have been sent, the officiant is taking care of some things for us, and she had us set up a group for the wedding party and DJ so she can talk to us as needed. Yay! You guys don’t know HOW much this takes off my shoulders. I was so seriously stressed out about the fact that we didn’t have an officiant and now we do, so woot woot!! Tomorrow is simply HAVE to get the mp3s ready for Elle. That is my #1 top priority. And maybe we’ll do bouquets tomorrow, too. Gah. And I still need wedding shoes!